The first panel shows a map of the layout of an airport terminal. A number of icons depicting aircraft can be seen in the runway area outside the terminal. A legend near the bottom shows symbols for: Gate, Restrooms, and Food. On the map inside the terminal area there are: 12 gates, 12 food locations, and 12 restrooms. The second panel shows a map of the layout of a shopping mall. A legend near the bottom shows symbols fo: Retail, Dept Store, Restrooms, and Food. On the map there are: one department store, seven retail locations, 15 food locations (including four inside an area labeled “Food Court”), and 16 restrooms. 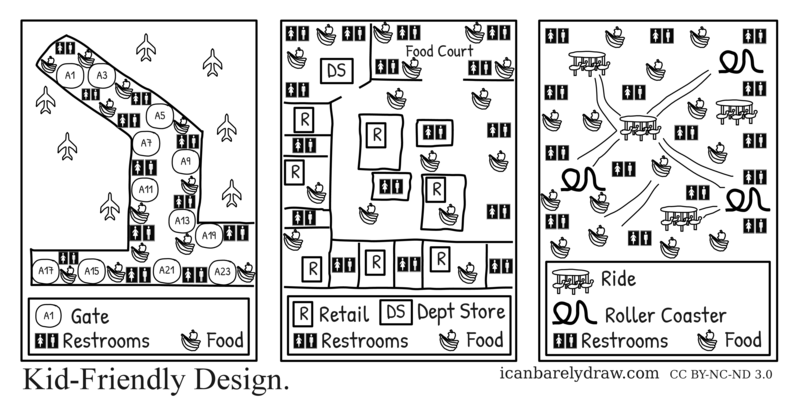 The third panel shows a map of the layout of an amusement park. A legend near the bottom shows symbols for: Ride, Roller Coaster, Restrooms, and Food. On the map there are: three roller coasters, four rides, 14 food locations, and 15 restrooms.